Enjoy a taste of the country in a privately owned home nestled on the 400 acre Albaugh Ranch in the beautiful Fall River Valley. Your family or small group (4-10) can enjoy the activities of the area while staying within the comforts of home. New central Heating and Air Conditioning has been installed. With exquisite views, this is the perfect wedding venue! Lush green lawns and an arbor of maple, walnut and apple trees create an intimate setting, while a backdrop of barns, fields and mountains enhance the array of photographic opportunities, all in one location. Our guest house offers four bedrooms, two and one half bathrooms, full kitchen and most amenities. The large, brick patio, complete with gas grill, is great for barbecues or social events. For those embracing nature, lounge on the lawn and take in the scenery. This working cattle ranch borders the Pit River and is home to fertile pastures, hay and wheat crops, and stocker and cattle pairs. Enduring four generations, this ranch exhibits a warm, familiar feeling of home. The Albaugh Ranch is just a 10 minute drive from the Fall River Valley Golf Club. This championship 18-hole course has been rated 4.5 stars from 'Golf Digest' and is known for its excellent 'pace of play', large greens and wide fairways. Also nearby are the world class fly fishing streams, Hat Creek and Fall River. Fishing season starts the last Saturday of April and runs through November 15th. To inquire about the Ranch as a wedding venue, please email: ealba@citlink.net for a quote as wedding rental fees differ from guest house rental fees. Keywords: Large, Ranchstyle, House, wedding venue with a view. Your Hosts are Elena and Stephen Albaugh. Stephen grew up on our family cattle ranch and is fourth generation. Today we farm, raise cattle and enjoy the local golf course. We keep the house available to share our little corner of this beautiful view. This family home is located on our cattle ranch and is used as a rental as well as family accommodations. We have hosted several weddings and the setting is beautiful. 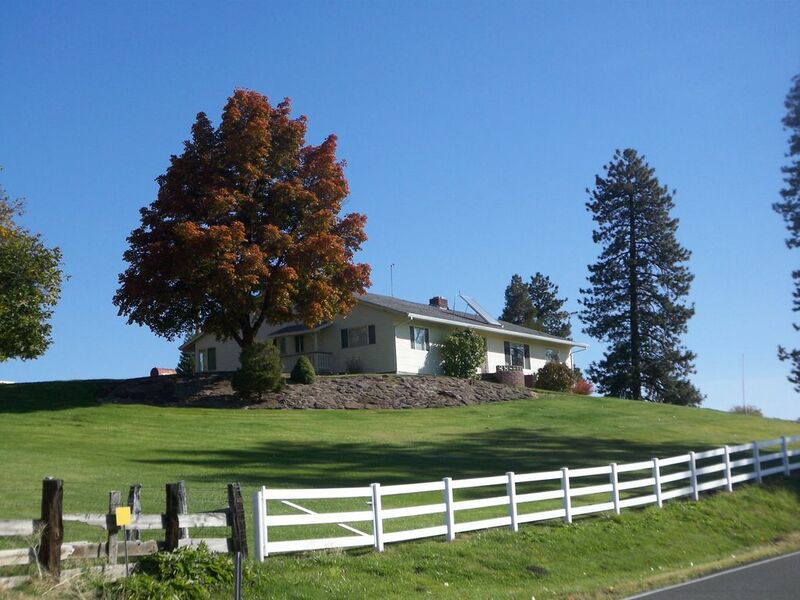 This home has one of the most beautiful views in all of Fall River Valley. Its quiet, serene and off the road. We have room for a gathering of all your family and friends. We are offering the ranch as your wedding venue. Newly installed is Central Heating and Air conditioning. toilet, located on porch near outside door. Large great room is connected to dining area and is perfect for a family gathering. there is a kitchen dining area as well as a large dining room with chairs for 10. Large lawn for children to play and area can be readied for wedding venue. We can accommodate up to 350 people. Fall River Golf Course is about 8 miles away. We will help you with your wedding venue. Local business, Valley Rentals (530-336-5500) will accommodate you with tables, chairs, tent and other items needed for your event. We also have an older car available for the bride: 1939 La Salle with driver. If you don't see it here, please ask. Awesome place for our whole family! We enjoyed Albaugh House immensely. It had enough beds and bedrooms perfect for us with 2 small families, one single, and my husband and me. We took a day trip to Burney Falls, less than an hour away, and that was incredible. Also went to the volcano tubes at Lassen Park. Amazing. Great family times around and in the house. The kids (and dogs) loved running around the big yard. Waking up each morning to the cows across the street was so calm and homey. We were close to Ray's Food store, too, and that was handy. We all brought food and having dinner together was a highlight. The kitchen was well stocked with pots, pans, and everything needed. Highly recommend! The house is clean and has many flowers in the yard. The newly installed house cooling system kept the house at a pleasant temperature even though we were there during the few weeks of the year when it does get hot. The patio was a great place to relax while watching the sunrises and sunsets and the grazing cows. The owners are very knowledgeable about the area and things to do. We absolutely loved our stay in your beautiful home. You provided everything we needed for our stay including a clean and very well equipped kitchen for cooking and enjoying meals served on Pfaltzgraff dishes! I could hardly get enough of the spectacular view of the valley during the day and the amazing nighttime sky with more stars than I think I've ever seen. We lost track of how many shooting stars crossed the sky when we sat out on the patio one night. Your home provides a little slice of Heaven with true country living at its best. Thank you for everything! We enjoyed our week here. The house is great, clean and attractive. Comfy. beds. Well-stocked kitchen. Plenty of everything. BIg windows with tranquil views of lovely pasture country and mountains in the background. Loved the jacuzzi after a day of hiking along the several nearby rivers where the dogs went swimming. Lots of hot water. Give Tex an apple and get a few feet from a super huge longhorn! Close to a small town with basic stores and a couple decent restaurants. Very convenient. Owner came to meet us so all felt good. The guest house is great for golfing groups going to FR Valley Golf Course, hiking at Lassen Park or going to Subway caves. We are now offering the property as a wedding venue and can host up to 300 in a wedding party. Please call for price quote and information. Wedding Venue base rate is $2,500.00 plus a refundable $500 security deposit, depending on the number of guests, contract, night stays, incidentals, etc.